Copyright: © 2018 Khan MS. This is an open access article distributed under the Creative Commons Attribution License, which permits unrestricted use, distribution, and reproduction in any medium, provided the original work is properly cited. Poultry industry is a domineering section of agriculture sector in the world as it provides meat, income and employment. Of the poultry industry, broiler chicken is dominating, as US export was more than 41 billion pounds of chicken (about 16.5 percent of production) in 2017 . In Pakistan, the poultry industry contributes around 1.4 percent to the GDP and 31 percent to total meat production . The global demand for this meat is rising in developing world including Pakistan. To meet the needs, rearing of poultry at both domestic and commercial levels is imperative . However, the industry faces a lot of constraints, preventing it from reaching its maximal potential. Poor welfare, insufficient quality nutrition and devastating diseases are some of these problems. Amongst the myriad of diseases, Infectious Bursal Disease (also known as Gumboro disease, infectious avian nephrosis and infectious bursitis) is an acute, contagious viral disease of chicken [4-6]. It not only affects domesticated but also wild poultry throughout the world by targeting the immune system. [7-9]. Gumboro disease is caused by Infectious Bursal Disease Virus (IBDV), which is a member of genus Avibirnavirus of the Birnaviridae family. IBDV is a non-enveloped virus having a capsid that contains a double stranded RNA genome, split into two segments A and B . Segment A of the genome encodes four proteins (VP2, VP3, VP4 and VP5) while segment B encodes VP1. Based on Pathogenicity the IBDV strains can be grouped into three pathotypes; classical virulent, antigenic variant and very virulent . Though the first outbreak of very virulent IBD virus was reported in Europe in early 1990s , recent pandemics across Asia, Africa and South America  have heavily damaged commercial and wild poultry. Contamination of a rearing site with the IBDV leads to a horizontal transmission of disease across the flocks through contaminated feed and water. However, vertical transmission is not reported yet . Classical virulent strains flaunt a mortality rate as high as 20-30%, mostly due to the widespread bursal damage in infected poultry . Classical virulent strains are the source of commercially available vaccines against IBD viral infections. In early 1980s, new antigenic variants emerged, causing more than 50 percent mortality in birds by rapid bursal damage . Current vaccines prepared from classical strains have failed to control the disease caused by these antigenically variant strains. In the late 1980s, very virulent IBD virus strains were reported that induced IBD with a more pronounced bursal lesion and higher mortality (up to 90 percent) when compared to other IBDV strains . In addition, vaccination against the very virulent strains encounters many challenges as very virulent IBD virus can breakthrough protective antibodies, and therefore requires more efficient vaccination approaches. Presently, killed and attenuated live viruses are used as vaccines to immunize poultry against infectious diseases. Despite all efforts, consistent outbreaks, even in vaccinated flocks are a source of concern. The probable reasons may include poor biosecurity measures and unrepressed viral shedding (release of virus particles from an infected host cell following successful reproduction). Vaccines prevent viral shedding more proficiently if these are developed from strains homologous to currently circulating genotypes , this warrants molecular characterization of evolving IBDV strains. One of the strategies to develop cost-effective and clean vaccines is expressing the engineered antigenic genes in edible plants. Such genes may be expressed from nuclear genome, both to accumulate the protein in the cytoplasm or targeting to plastids, expressing engineered genes from the chloroplast genome [19,20]. Of these strategies, expressing genes from chloroplast genome is more advantageous since proteins may accumulate to exceptionally high levels with bona fide structures [21,22]. High level expression in chloroplast is due to the polyploid nature of the plastid type and plastome (the plastid genome). Further, presence of chaperonin proteins in plastids  helps proteins to be biologically active. Precisely describing the technology, a gene of interest under the control of a promoter and a terminator along with another gene that confers resistance to an antibiotic is cloned between the DNA fragments from the plastome - used as left and right borders - to target the enclaved genes into the plastome through two homologous recombination events [24,25]. The antibiotic gene is used to select and screen the recipient plants. Poultry vaccines (edible or non-edible, Figure 1) have been developed successfully from plants where nuclear genome is transformed [26,27], however, from plants with transformed chloroplasts are underway. Leaves of plants with uniformly transformed genome (developed using gene gun or Agrobacterium-mediated method of transformation) are used either to extract the expressed antigenic proteins (in case of non-edible plants) or to directly feed birds (in case of edible plants). However, seeds are used in the feed or to store the transproteins longer period without the cold-chain requirements. Vaccines developed by expressing vp2 gene of IBD have induced Ig G response and immune protection in one to four-weeks-old chicks . When vp2 gene was expressed in rice and grains were used to immunize the chicks, neutralizing antibodies were produced that protected birds from very virulent strains when double amount of antigenic protein was orally administered . 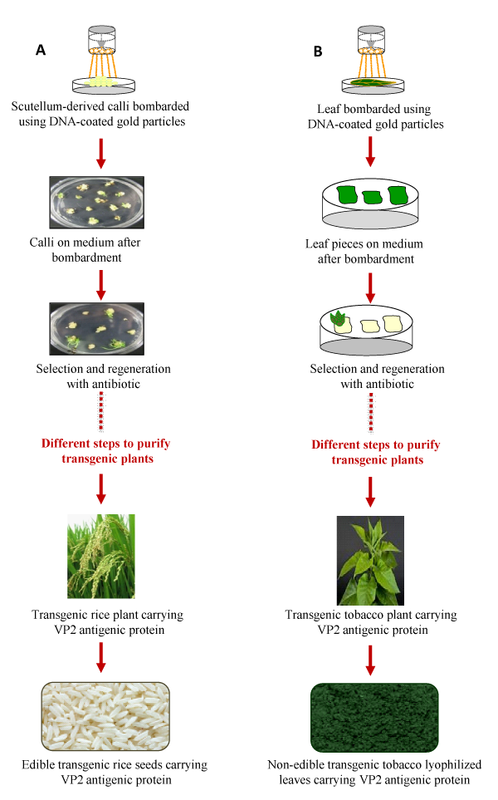 Figure 1: Transgenic plants expressing vp2 gene. A. Edible transgenic rice plant carrying VP2 antigenic protein in seeds. B. Non-edible transgenic tobacco plant carrying VP2 antigenic protein in leaves. Lukert PD, Saif YM. Infectious bursal disease. In: Saif Y. M. (Ed.) Diseases of Poultry (11th ed.). Iowa State University Press, Ames, Iowa. 2003; 161-179. Rosenberger JK, Cloud SS, Gelb J, Odor E, Dohms SE. Sentinel birds survey of Delmarva broiler flocks. Proc. of the 20th National Meeting on Poultry Health and Condemnation. Ocean City, MD, US. 1985; 94-101.